THE ENDURING VISION's engaging narrative integrates political, social, and cultural history within a chronological framework. 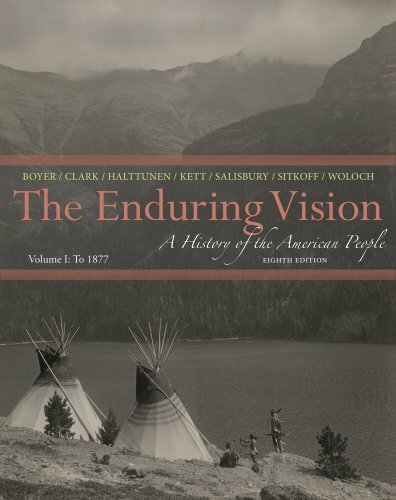 Known for its focus on the environment and the land, the text is also praised for its innovative coverage of cultural history, public health and medicine, and the West--including Native American history. The eighth edition incorporates new scholarship throughout, and includes a variety of new photos. Based on the popularity of the "Going to the Source" feature, which was introduced in the previous edition, additional "Going to the Source" selections are offered online in the eighth edition. II (3e, 2003). He is also editor-in-chief of the OXFORD COMPANION TO UNITED STATES HISTORY (2001). His articles and essays have appeared in the "American Quarterly," "New Republic," and other journals. He has been a visiting professor at the University of California, Los Angeles; Northwestern University; and the College of William and Mary. fellowships from the Guggenheim and Mellon Foundations, the National Endowment for the Humanities, the Huntington Library, and the National Humanities Center, and has been principal investigator on several Teaching American History grants from the Department of Education. Quarterly," and is a past member of the Council of the American Studies Association. INDIAN HISTORY. He is active in the fields of colonial and Native American history and has served as president of the American Society for Ethnohistory and on the Council of the Omohundro Institute of Early American History and Culture.